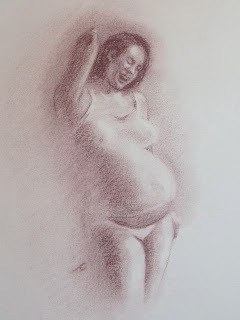 Tina Collins - Art Diary: Cousin Kerry pregnantly patient! Not really a cousin, a bit of an in joke. Sketches for a painting, all pretty small, sub A4 so I am quite pleased that I have managed to capture a reasonable likeness. I took hundreds of photos and have lots of material to work from, its so much easier if you can control the photo session. 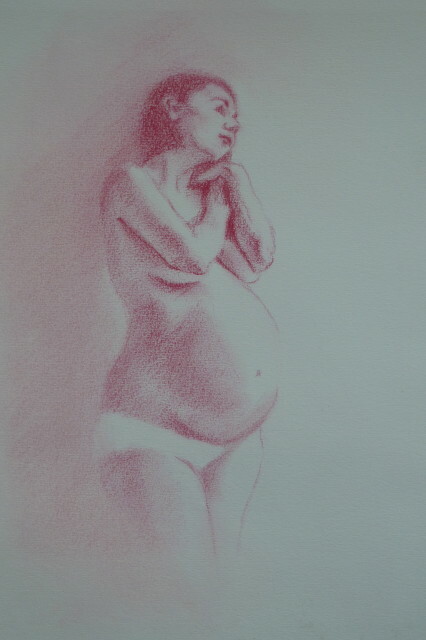 The subject wants her bump celebrated in paint but we are still deciding how to proceed. Inspiration will come, hopefully before the baby. Pastel pencil on Canson mi-teintes.